Now that it’s winter, we’re catching up on some past-due blog posts. 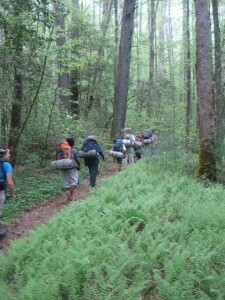 Expect more stories about trips from the spring and summer of 2011 to be posted in the next weeks. 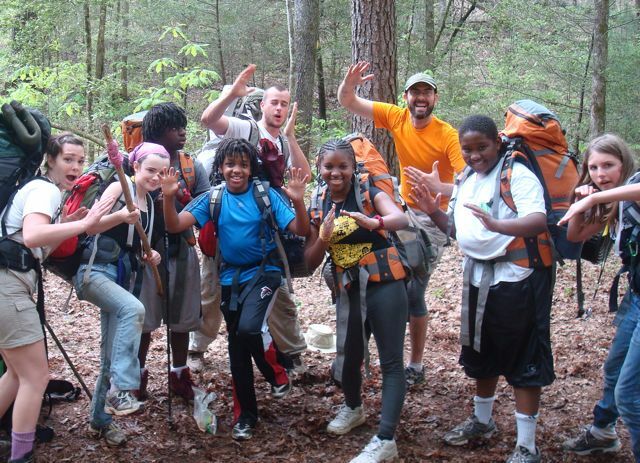 The Big Picture: We’ve been working with Kingfisher Academy students for several years now, and by the Spring of 2011, the middle school students were virtually pros at camping. With beautiful weather, we set out for a two-day camping trip near the Chattooga River. Because this group of students had so much experience camping (they had even been on a full-fledged backpacking trip in the fall), our goals on this trip were to introduce them to some of the flora and fauna of north Georgia, learn some fire-by-friction skills, and have fun! 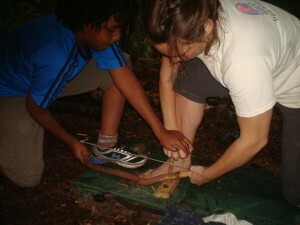 Activities: Though we walked 1/2 mile to our campsite, this didn’t tire the students out. The sun was shining, so we went down to a sandy beach along the Chattooga and swam. I’m still amazed that the kids stayed in the water as long as they did (it was kind of chilly to me!) but this was a group of water lovers. Unfortunately, we heard thunder that evening, and had to set up a large tarp structure to stay dry around the fire that evening. Sarah and Tyler (two of our guides) gave lessons on making fire using a bow-drill. 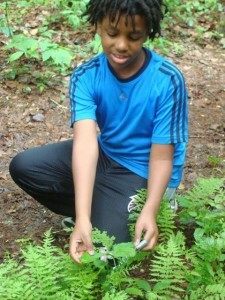 The next day, we took a day hike and taught each student one native plant that has a special use. The students, in turn, had to teach each other the plant that they were now an expert on. Graduates: On this trip, we had three students would be graduating from Kingfisher Academy in May. Upon graduation, these students had each been on at least 3 camping trips with me though none of them had ever been camping before coming to the school. I hope these take this experience with them in their lives, knowing they can do anything!